A cook works on khorovats skewers at Taron Restaurant in Yerevan. 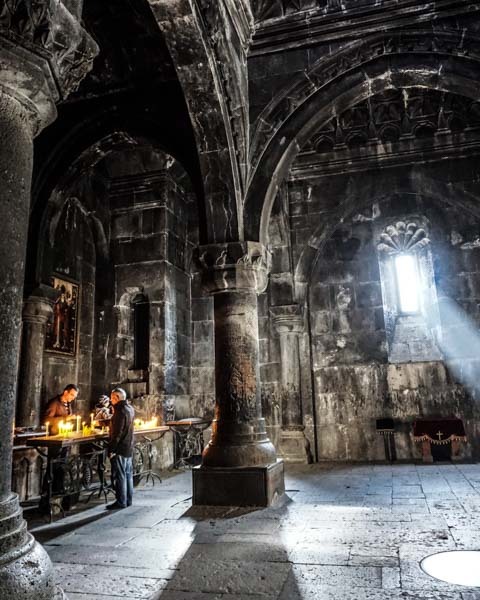 Sitting on a cliff overlooking the Debed Gorge in northern Armenia, the Haghpat monastery is a stunning UNESCO World Heritage site worth the hair-raising tour bus ride up a mountain road. Yet the monastery's ancient kitchen has stood empty for years, and the only other food option is a snack bar at the edge of the property. It's here that Armen Qefilyan saw an opportunity. Why not entertain these hungry tour groups with khorovats, Armenia's favorite meat-grilled-on-a-stick tradition? Qefilyan isn't just another khorovats hobbyist, of which there are countless in Armenia. In 2009, he was crowned champion in a national khorovats competition. After years of running a restaurant in the nearby copper mining town of Alaverdi, the chef's newfound accolades allowed him to set his sights higher—straight up the mountain. We paid Haghpat a visit this past May on a research trip across Armenia for our cookbook, Lavash, due out in the fall of 2019. For the trip, co-authors Ara Zada, a Los Angeles-based chef, John Lee, a San Francisco-based photographer, and I, a San Francisco-based cookbook writer, teamed up with Christine Goroyan, a translator from Yerevan, and Raffi Youredjian, a childhood friend of Zada who had recently relocated to Armenia. Youredjian was the one who had told us about Qefilyan—he had met the chef while writing Tour de Armenia, a book chronicling his cycling journey around Armenia. All Youredjian needed to say was "khorovats champion," and we knew we had to make a stop at Armen's, Qefilyan's namesake restaurant. Youredjian had called ahead to ask for a special table set outside for us, since the unpredictable weather of the Lori region seemed to be cooperating. Overlooking the gorge, our table under a tree was covered with linen and lined with plates. Pitchers of kompot and carafes of local vodka were ready for us to start toasting to our luck with lunch spots. Qefilyan joined us, and before the first plates of khorovats could arrive, I began firing him questions (translated by Goroyan), to learn about his champion technique. The remains of lunch at the restaurant Armen’s. Part of the reason has to do with scarcity: obtaining enough good-quality meat to grill was never guaranteed during Soviet times. It then became a rarity during the post-Soviet period of the 1990s, when even bread was scarce. These days, however, inviting people over for khorovats sends out the signal that life is good. The celebratory nature of khorovats was on full display on May 8 when Nikol Pashinyan was voted in as Prime Minister. Traffic stopped in Yerevan to make room for one big street party. And the food that fueled the celebration? Khorovats. Partiers dragged their charcoal-fueld mangals into the streets and danced with skewers of meat in their hands. That's what makes khorovats easy to like: the equipment is lo-tech, the preparation simple, and the char-grilled results a dependable way to soak up all that celebratory vodka. Skewers of meat on a mangal as revelers celebrate Nikol Pashinyan’s election victory, left, and Qefilyan’s pork khorovats, right. Like barbecue enthusiast across America, khorovats competitors take their technique seriously. Monitoring heat is crucial. While it's not quite the low-and-slow technique favored in American barbecue, Qefilyan stressed the importance of a gentle fire. He said he holds his hand over the mangal and counts to twelve—if the fire is too hot for his hand, it's too hot for the meat. This was unusual compared with khorovats we saw prepared elsewhere where the flames licked the meat, charring the outsides. We asked Qefilyan what he prepared to for the competition. 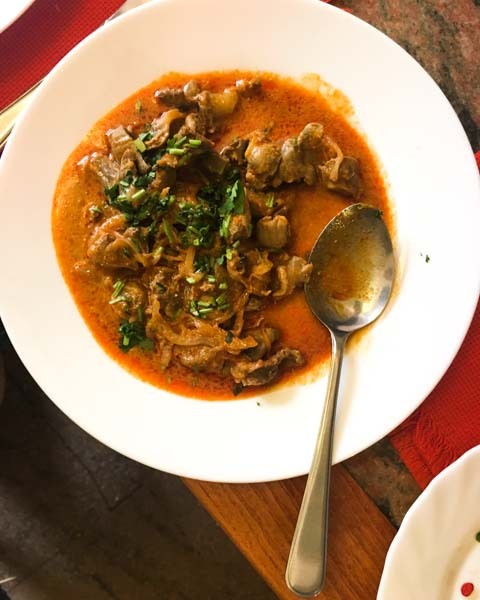 While pork is the most common meat for khorovats in Armenia (an influence carried over from Soviet times), he chose lamb, seasoning the chunks of meat simply with salt, paprika, black pepper, and thyme and threading a little lamb fat on the skewers between the meat for richness. For nearly 40 minutes, he cooked the meat, turning it frequently to cook it evenly. 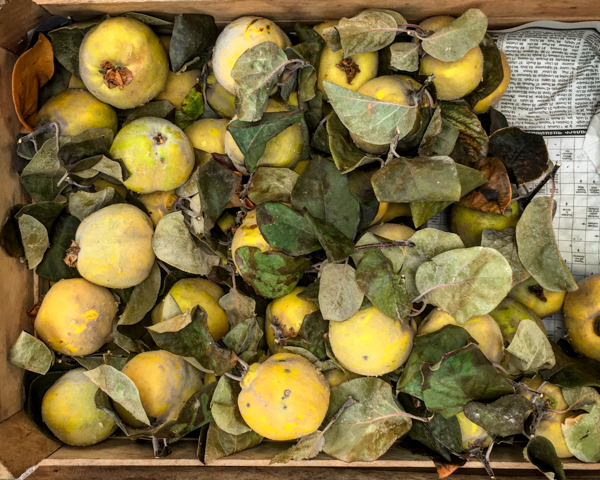 To perfume the smoke, he went untraditional, spearing quince halves seasoned with allspice and clove onto rose hip branches and putting them over the fire. As the quince juice dripped into the coals, he explained, the smoke seasoned the meat. When it came to presentation, he stuck with tradition, laying out a sheet of lavash and arranging the meat on top, decorating the top with pomegranate seeds. It wasn't the decoration that won him the top prize, though—it was the flavor. By now, platters of khorovats had started to arrive at our table, and we turned our attention to the chunks of pork mixed with sliced onion, the sides of salads and cheese, and the basket of lavash that was now within reach. The interview was done: it was time to dig in—after we toasted our champion host. Here is a video we put together for a talk we did at Tumo, discussing how we researched a cookbook during the middle of a revolution. In Yeghvard, a village outside of Yerevan, home bakers offered us a platter of cheese and herbs to eat with the fresh lavash they were making. The first lavash we ate after arriving in Yerevan came from the corner store near our rental apartment. It was pale and paper-thin, but durable enough to wrap it around scrambled eggs and cheese. This lavash wouldn't be the lavash that changed our lives, but it served an important purpose: refueling our brains after two days of airports, layovers, and plane seats. The "we" in this story comprises Ara Zada, a chef, John Lee, a photographer, and me, a food writer. Our admiration and interest in Armenian food is what brought us together to form the team behind the cookbook Lavash, to be published by Chronicle Books in 2019. Ara grew up going to an Armenian school in Southern California, but he wanted to dig deeper into his heritage. 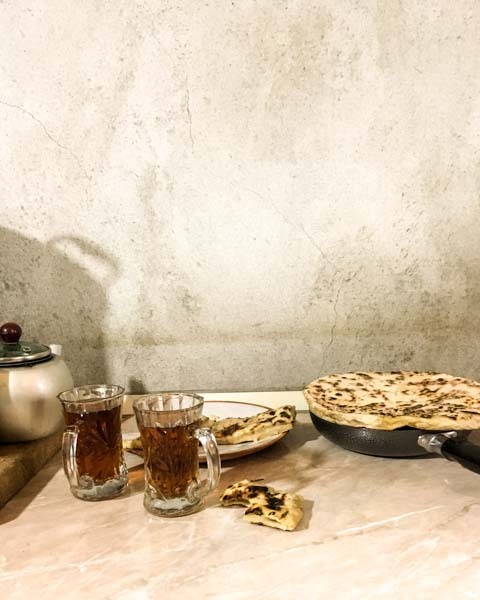 John got to know Armenian food—especially lavash—while teaching a food photography workshop at Tumo, an after-school digital media and cultural learning center for youth in Armenia. And I got hooked in college while writing thesis on food and Armenian cultural identity. 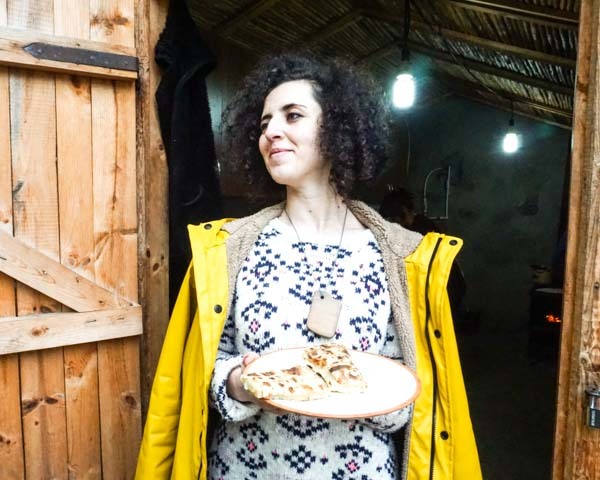 Through friends and Tumo's global network, we met up and set out to create a cookbook about Armenian food, with lavash firmly at the heart of the story. Why lavash? It's the most culturally important bread in Armenia, added to Unesco's intangible cultural heritage list in 2014. The act of baking lavash has also been documented in countless paintings. In the 1970s, President Gerald Ford even selected a print of "Armenian Ladies Baking Lavash" by Armenian-American artist Manuel Tolegian for the White House Bicentennial Collection. Yet lavash is also painfully misunderstood outside of the Caucasus. (One English-language cookbook suggested that tortillas make a good substitute—they don't.) Even the factory-made lavash we ate for breakfast, which came in a plastic bag, was miles ahead of the flatbread's imposters we had sampled back home. But it wouldn't be the last lavash we ate, either. If we wanted to learn how to make the real thing, we were going to need to venture much farther than the corner store. The first stop: GUM Market, a large covered market near downtown Yerevan. 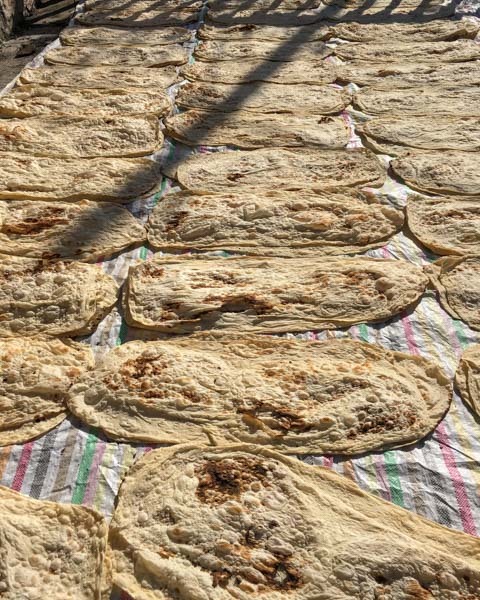 In addition to the bright rows of dried fruit and nut vendors at the front of the market were tables stacked with large sheets of lavash, some were thicker and more blistered while others were light and tissue-thin. Periodically, the women sprinkled water over the stacks of bread using a water bottle with holes punched in the lid. This helped refresh the bread, keeping each sheet pliable. That's one of the great things about lavash: all it needs to come back to life is a splash of water. Stacks of lavash line the tables in one corner of GUM Market in Yerevan, where customers can choose between thin and thick varieties. In the fall and winter, GUM market also sells lavash that has been rolled and dried to crumble into bowls of khash, a rich bone broth. We started talking to the women. "Why does this bread have so many blisters?" we asked. It's baked in a tonir, they answered, referring to the subterranean clay oven heated with a wood fire at the base. Like naan in a tandoor, bakers stick lavash to the sides of the oven to bake it, which gives it irregular blisters. In comparison, factory-made lavash is much more uniform in color. "Does the bread have yeast?" "Yes, drozhzhi," they said, the Russian word for yeast. Was it commercial yeast or something more like a sourdough starter? That they couldn't tell us. If the women selling lavash at GUM could share part of the story, the rest could be gathered at a tonir village, a place known for the goods it makes from a tonir. 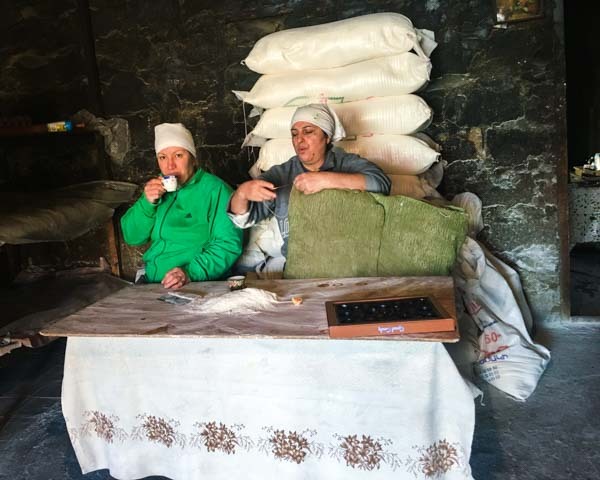 But when we arrived in Argel, a village about 20 minutes outside of Yerevan, the women were taking the day off from baking. Instead, they were busy hanging strands of arishta, a pasta made from a salty flour-based dough, out to dry on clotheslines. We drove instead to Yeghvard, a nearby village, where a friend said her neighbors were baking lavash to prepare for winter. The large house had two green houses in the back while the floor of the entrance and the roof were covered in bedsheets. On the sheets were rows of just-baked lavash, drying in the open air. Between the house and the greenhouses, a tonir smoldered away, surrounded by four women, each with a different job, from shaping, to rolling, stretching, or baking the bread. To remove the bread from the wall of the tonir, one of the women used a hook to fish it out, letting it cool for a few seconds before stacking it on top of a pile of baked lavash. In Yeghvard, each neighbor tool on a different responsibility around the tonir: some rolled the dough, some removed it from the walks of the tonir. But the most challenging job was spinning and stretching the dough out into a thin sheet. Balls of dough waiting to be rolled and stretched out for lavash. The home we visited in Yeghvard had an outdoor tonir in the backyard between the main house and the green houses. It's traditional to bake lavash in the fall to eat all winter long. At the home we visited in Yeghvard, the floors and roof were lined with lavash. Once dried, it was stacked and stored in a spare bedroom. The bakers handed us strips of warm lavash and pulled out a plate of salty cheese, cilantro sprigs and skinny green onions to eat with it. Slightly charred and warm, this lavash was in a different league from the store-bough lavash from our first morning—chewier, less fragile, and deeper in flavor. 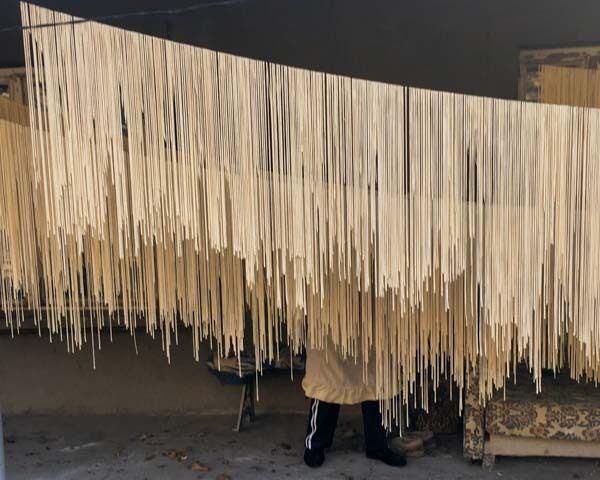 The women explained that they're neighborhood friends and always get together to help make lavash in the fall, but only to eat for themselves, not to sell it. Once it's dry, they stack it and store it in a spare bedroom. We took a look: there was enough lavash in the house to stock all of GUM Market. "Do you add yeast?" we asked. Yes, yes, they said, and then dictated their recipe. We ate a few more lavash wraps before thanking them and heading back to Yerevan. A few days later, we returned to Argel on baking day so we could see the village in action. The women had similar roles as the women in Yeghvard, with an addition: One manned the shop, counting out change with an abacus when men rolled up in vans to purchase piles of lavash to resell elsewhere. It was a cold morning, so the bakers invited us to with our legs dangling in the hole next to the tonir to warm our feet while they got ready to start baking. The woman who mixed the dough to make lavash was also responsible for portioning it out, which she could do by eye without the help of a scale. Do you add yeast?" we asked the woman mixing dough a large, old mixer fitted with a dough hook. Yes, she said, but she also saved dough from the day before and mixed it into a new batch. Why? We asked. For flavor and texture, she explained. She then covered the dough with a jacket to keep it warm while it rested in between mixes. We then stayed quiet, not wanting to interrupt while the women cranked up the fire and settled into a fast-paced rhythm of rolling, streching, and baking dough. When it was time for a break, one of the bakers walked to the back of the shop and pulled out a pot of hot, boiled potatoes and some pickled beets and peppers. We wrapped the potatoes around the lavash. Without expecting much, we took a bite. 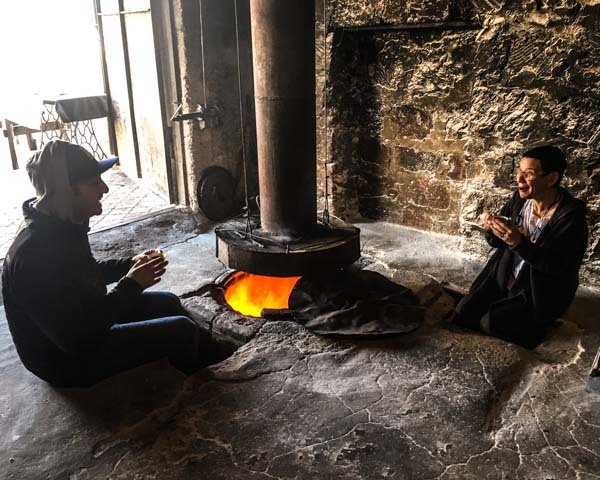 Maybe it was the smell of the wood-fired tonir, maybe it was the superiority of the potato, maybe it was the feeling of getting this close to the source—whatever was the reason, it remains one of the most unforgettable things we ate in Armenia. On our trip back to California, we packed lavash so we could keep enjoying it while we worked out the recipe. Like the lavash at GUM market, it rehydrated easily after being misted with water. That precious supply, however, is gone. And now the real work begins-- recreating that same lavash satisfaction, but this time in America. John Lee, the photographer for the Burma Superstar cookbook, Ara Zada, an Armenian-American chef from Los Angeles, and I are working on a new cookbook about lavash and the dishes you eat with this endlessly versatile flatbread. Lavash is so important to Armenia that Unesco recognized it as a key component of the country's heritage. Lavash (the book) will come out Fall 2019 with Chronicle Books. To truly understand lavash, we're heading to the source, Armenia. 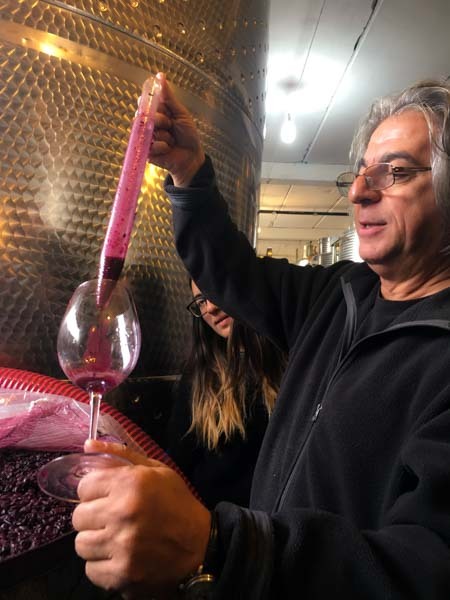 We also will delve a little deeper to the food and wine traditions of this corner of the Caucasus, a part of the world that has been a crossroads between the East and West for thousands of years. I'll be writing more about the backstory of how we came to write this book and how we're planning to complete it. But for now, I'll leave it at this : at its core, lavash is a celebration of a simple bread eaten with simple food, which in itself is a true reflection of this resilient, beautiful country. For more, follow along on our trip on instagram @lavashthebook.